We're in the middle of football season and rolling into holiday shopping season. The synchronization between the two has meant that football merchandise is a gift that is both easy to think of and easy to find. 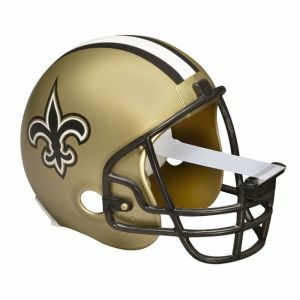 So it's entirely possible that the football fan in your life has their team's colors on everything in the room/house/property. Now the fandom can extend to their choice in office supplies. Behold! 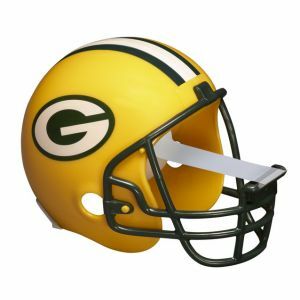 NFL Helmet Tape Dispensers! 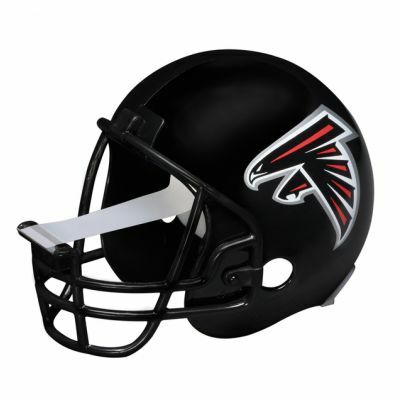 Each helmet has a standard roll of Scotch tape and can be refilled with... standard rolls of Scotch Tape. 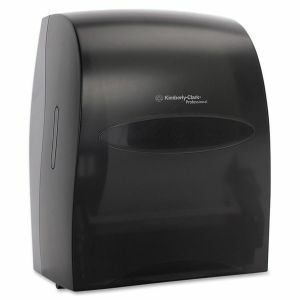 The dispenser joins a long list of nifty tape dispensers that add flavor and life to any office. Right now, about half of the league is available, with more stock arriving for additional teams. Soon you'll be able to get everybody in the league, no matter your preference. Heck, get a bunch so you'll have every matchup on hand. College football fans will have to wait for univerity-based adhesive, but something tells me they won't have to wait long. There are some debates where everybody has an opinion, but most of us are smart enough to keep our mouths shut. Proper toilet paper positioning and usage of the Oxford comma come to mind (a third example would give away my opinion on the latter). Public restrooms are the battleground for another such debate: given the choice between a towel dispenser and an air dryer, which will you gravitate toward? While we're all buying toilet paper no matter how we put it on the roll, this is a fascinating battle as makers of both have millions of dollars invested into being right... or at least prolonging the argument. Team Towel argues better cleaning efficiency and less contamination. Team Dryer points out that dryers don't need to be refilled and create less garbage. Incidentally, the deal offering a free dispenser with a towel purchase is still running. Truth is, at one time this had been objectively settled: paper towels are better by a landslide. Hand dryers take longer to dry (the high energy output almost cancels out the lack of waste) and bacteria from your hands get blown all over the room rather than end up in a tidy little disposal container. 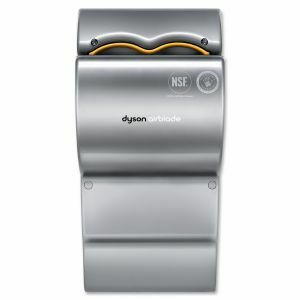 This fight was over until the Dyson Airblade came around. With jets on both sides drying hands faster, dryers still have some fight left in them, despite claims of even worse bacteria contamination (don't touch the surfaces of those things. Seriously.). New studies found that towels still have an edge as jet dryers do more to mask their problems with brute force rather than actually solve them. And everyone agrees that washing your hands properly is far more important to avoiding disease than your drying method. Still, as dryer technology improves, the debate is bound to continue. We've talked about the importance of having an office shredder instead of relying on third-party shredding services. We've also talked about making sure your company has the right shredder. We've also gushed over Swingline's Stack-and-Shred shredders that do the tedious part for you. Now here's an offer that allows you to not only take our word for it, but see for yourself with no risk. This is an opportunity to try one of five Swingline shredders with a free return if you aren't satisfied. 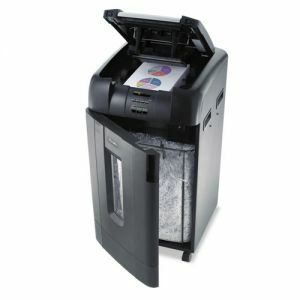 Under this program, you won't have to worry about being saddled with shipping costs if a shredder doesn't work for you. We doubt that would happen, as the selected shredders are all designed for heavy office use, including three different Stack-and-Shred models. All of the shredders are cross cut, shredding paper into small confetti-style particles to guarantee your security. For more information on shredding size or to see more shredders, check out our buying guide. 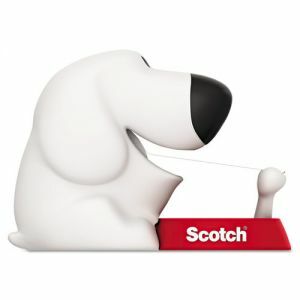 This is a Officesupply.com product availability alert! Hon is known for quality and classy business furniture and they wanted us to get the word out about a couple of their lines that are being discontinued later this month. Time is running out on getting a brand of desks, credenzas and drawers that combine subtle touches of style with convenience. The Hon Attune series will be coming off the market on September 28. The series is designed to offer a contemporary look while offering neat accents like frosted glass modesty panels and slim pedestals. 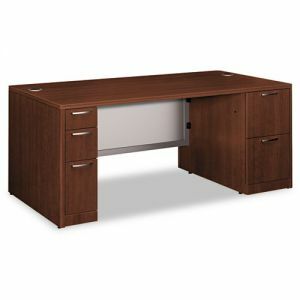 If you're still looking for desk furniture after the Attune series is gone, consider the Hon 10700 series. This is durable laminate furniture that has a similar modern look at a much lower price. Another of Hon's sets scheduled to be discontinued is the Simplicity series of panels. These are used to create cubicles and workstations. The suggested replacement is the Versé series by Basyx. This series is easy to put together, offers color options that go better with other Hon furniture and is still lined with the same fabric to allow employees to hang photos, organizers and anything that makes their job easier and more comfortable. It used to be pretty hard to be stylish at the office. Much of the furniture is uniform throughout the room, there's only so much desk space available for adding a personal touch and a lot of basic office supplies don't lend themselves well to fashion. That's why it's important to seize on the items that can offer a bit of liveliness. When you spend so much time at your desk, it always helps to add flair wherever possible. This section will host a growing collection of stylish office supplies and furniture. 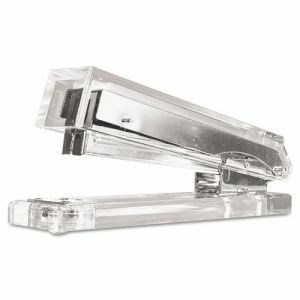 Products range from office chairs, desks and accents to letter trays and essentials like staplers and tape dispensers. Kantek's clear acrylic numbers are smooth. Look around and see what appeals to you, whether it's bamboo pencil cups and desk organizers or laptop cases and mice. 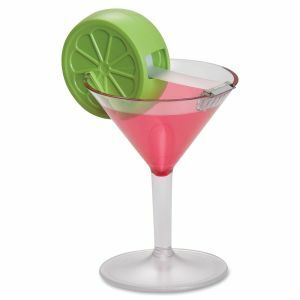 Keep checking back for more trendy office products! This is a big opportunity for the new business owner, or anybody that would like to make improvements to the company restroom. The idea is simple- go to this page, choose the paper towel or bathroom tissue of your preference and purchasing the specified number of cartons will net you the associated dispenser for free! All you need to do is enter the coupon code for that dispenser. All of the dispensers are from Kimberly-Clark, which delivers quality paper products like Kleenex and Scott brands. 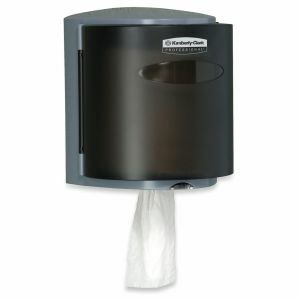 The dispensers are not only your basic pull towel dispensers either. This touchless dispenser is available, as is one central pull towel dispenser. The number of cartons you'll need to purchase number anywhere from one to five, presenting some great deals on anyone in the market for a towel dispenser. Do you have your school's list of recommended supplies for your child? Pull it out now as this sale on essential school supplies is bound to save you money! Some of the most common and most requested school supplies are listed here at steep discounts. You don't have to spend time debating which pen or notebook or binder is the best. We've already offered our recommendations for each. Along with pens, notebooks and binders, you'll find pencils, erasers, rulers, crayons and even scientific calculators and those nifty speed dial combination locks we've featured in the past. Naturally, if there are other items on your list or you want to see all of the options for students, teachers and the classroom itself, check out the vast selection of school supplies here. The Back To School pricing event runs through September 22! Back to School season is nearly upon us. It's time to start thinking about everything students will need for school... and the associated drain on your budget. We're going to make your life easier. How would getting a gift card for up to 20% of your purchase sound? That's the new deal Tops Products and Cardinal are rolling out from now until the end of September. Buy $50 worth of qualifying products and you can send in for a $10 gift card for either The Home Depot or Target. The qualifying products are things that you'll probably need anyway, like notebooks and binders. 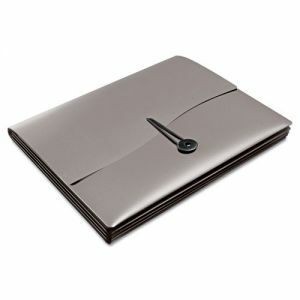 The Cardinal binder pockets can help keep your binder organized. Not only do the pockets allow additional storage for papers that may not be hole punched, they also act as dividers to sort the binder into sections for easy organization. Zipper binder pockets zip up, allowing larger items like pencils or handheld calculators to be stored easily. You'll also find binders available, and everybody can use those in the office. Remember, it's not just students and teachers who are eligible for the gift card! The dry erase board has become such a permanent fixture in conference rooms, schools and the doors of every college dorm room that not much thought is given to it. They're so commonplace that it's hard to remember that they only gained popularity about twenty years ago. That's not a long time in the office supply world; the Post-It note has been around for 35 years and we still think they're magic. However, with such ubiquity often comes a lack of responsibility. A whiteboard is more complex than just a glossy surface and “does it fit the space” should only be the first question asked. How often will the board be used? Will it be used for presenting or planning and organization? Does it need a tray to store markers and erasers? The answers to these help determine the type of board you're looking for, and this page will help you find it. One of the biggest problems to contend with is ghosting, which leaves marker stains that are difficult to erase. This is a result of ink getting soaked into the board's melamine surface. Melamine boards are the cheapest type of whiteboard, and while they work well for light use like a workspace or breakroom, more important functions require something better. 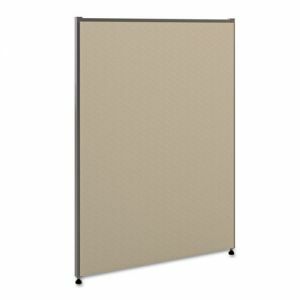 For boards that will receive heavy use such as schools and conference rooms, consider a porcelain board. Porcelain isn't porous like melamine, so the surface is smooth, durable and will not stain. Furthermore, porcelain whiteboards are magnetic, allowing you to use magnets to create a full planning center. If you aren't sure which board is the best fit for you, you're in luck! 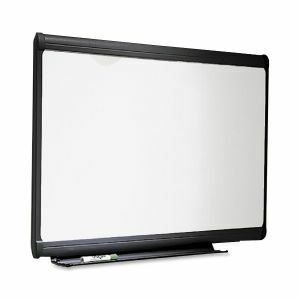 Now you can get free return shipping on all Quartet whiteboards. This way you won't have to worry about looking for the right dry erase board before you try it out. If it doesn't work for you, you can return it for free! Whether it's for career, family or education (or this time of year, more likely the end of it), we're reaching the apex of moving season. In fact, while summer is the most popular time for moving, spring may actually be the best time for it. The weather is nice but not sweltering, moving companies aren't charging premium rates yet, and kids are getting out of school. It also may be mandatory in the case of college students graduating and shipping off to start their new career (or, in many cases, returning to their parents' house). In any event, there are many stages to planning the move. You'll need to take an inventory of what you have, decide whether to hire movers or do the job yourself and notify everybody that needs to know where you're going. There's going to be a lot of paperwork involved with this, so you'll want something to keep it all together like an expandable wallet or accordion file. 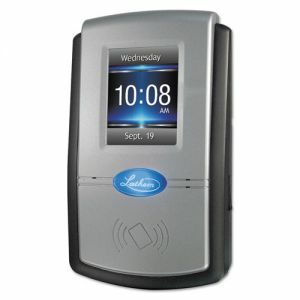 These are durable, have enclosures and include multiple pockets for classification. The inevitable feeling as you pack is that you have too much stuff. Don't spend the day running to the store buying more things. Acquire all your packing essentials in advance. Boxes are obvious. You're gonna need boxes. Don't forget to think about the size of boxes you're looking for. Larger boxes can fit more but are harder to carry, while smaller boxes are easy to carry but can only hold certain items. When buying, this page can help filter your options by size to find the right boxes for you. 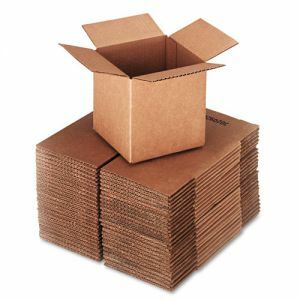 What about packaging materials? When everything, including fragile items like dishware, have to be moved, it takes a great amount of care to make sure nothing gets broken. That's why we recommend packaging materials to serve as cushioning. Make sure you have twine and either bubble wrap, foam wraps or Styrofoam peanuts to lessen the rigors of travel on your fine china. If you're moving on your own, can you or your friends lift everything? If not, a dolly or hand truck makes life considerably easier and makes the move that much faster. Other items that will come in handy are a black marker for labeling the contents of all these boxes, proper packaging tape for sealing the boxes securely, and a utility knife for opening them once the move is complete. It's not news that we as a country are getting less healthy. Obesity is on the rise, owing in part to a more sedentary lifestyle. Quite simply, we're not active enough and it's affecting our health. Exercise and proper diet can help, of course, but a new approach to office work is attacking the problem by cutting down on an unhealthy activity that has become essential to many jobs- sitting. Sitting for long stretches slows metabolism and leaves people at risk for heart disease, diabetes and other life-shortening ailments. Unfortunately, that's just what many of us have to do everyday at our jobs. While proper posture and an ergonomically friendly desk will cut down on eyestrain, back pain and wrist injuries, it doesn't reduce the risk of long-term problems. As a result of these studies, one of the latest office trends is installing workstations that reduce or eliminate sitting entirely. Ergonomics are still in play, of course. The keyboard should remain at elbow level, the top of the monitor should be just below your eyes and at an angle, and try not to slouch. This buying guide will help sort out different options for standing desks. In particular, how to tackle the obvious fatigue problem. Standing all day will wear you out, so having a stool or a surface to do some sitting work is important. Even if you're not ready to make the jump to a standing workstation, there are routines you can get into that promote good health. Stand up and walk around every twenty minutes. Add more walking by parking farther away and taking stairs instead of the elevator. The site Compliance & Safety has a graphic with several exercises you can do while at work. Doing these is not only a break from sitting, they also stretch out various muscles. Now that the weather's getting warmer, another healthy tip is to bike or walk to work if you live close enough to your job. We love Tombow products around here. Not that that's controversial. 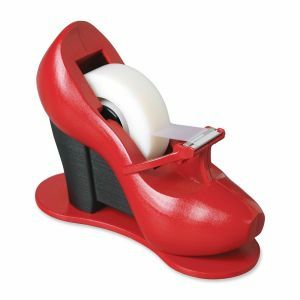 Their adhesive dispensers and associated refills are best-selling products and their correction tape dispensers have been described as the Cadillac of correction tape. It doesn't take much prompting to get us to gush about their products, but some recent developments has us even more eager to talk about them. Tombow actually sells two versions of its popular adhesive tape. There's a version that you would buy in office supply stores, targeted towards creating presentation displays. Then there's a version sold in craft stores, aimed at scrapbookers. It's all the same stuff, just with different packaging, and Tombow has come to the realization that doing this was kinda silly. So they're phasing out the office version, the ever-popular TOM62201 dispenser and its TOM62202 refill, and selling the same thing everywhere. Equality for the win! This is fantastic news because while it's the same tape we all love, the Craft Collection version, model TOM62106 with refill TOM62107, has 33 percent more tape on each roll. That means more bang for your buck for all your scrapbooking and office needs. The Craft Collection refills will still fit the TOM62201 dispenser and work just as well. Best of all, from now until July, ordering $50 or more of eligible Tombow products will net you a $10 gift card from a number of popular retailers and restaurants. A $100 purchase gets you a $25 gift card! Check out this page for the rebate form and a list of eligible products. Most correction tape products are on the list, as are the Craft Collection adhesives, making this the perfect time to switch for those used to ordering the TOM62202 refills. The hardest part in having a proper, functioning filing system is developing the groundwork. It's easy enough to conceive a system, but unless it is ideal for your office and without the right supplies and storage options, it won't work. A good system not only gets the job done, it is simple, logical and effortless enough that you'll stick with it. The first step is making sure the right folders are in the right place every time. The first thing to determine is how often files need to be retrieved. This can help determine whether an end tab or top tab system is right for you. Either way, this guide can help you find the folders you need. End tab filing systems stack on a shelf along the wall, making both the folders and their labels readily visible for everybody to access. These are perfect for reception areas, particularly at clinics or offices where all employees need to pull client files quickly. Files that aren't recalled as often should go into hanging file systems. 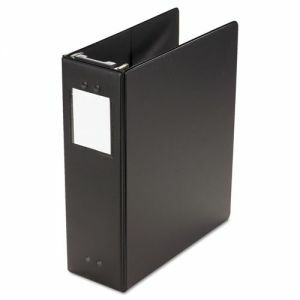 These are top tab folders that hang on rails built into most cabinets and pedestal files. Files meant for one employee or a household should go into a pedestal file that fits under the desk (frames are available for drawers without rails). General company files that everybody may need access to or that accumulate over time should go into a central filing cabinet. Vertical filing cabinets take up less space but are harder to retrieve files- use these for archives that won't need to be recalled often. Since lateral files keep all files closer to the floor and are filed from side to side, they are easier to retrieve and should be used with items that are more likely to be needed again. While large stacks in a single folder may defeat the purpose of organizing papers, use box bottom folders when it's necessary. Box Bottom folders are reinforced at the bottom and will support more weight. Files that a single user will refer to frequently shouldn't be stuffed into a cabinet at all, but that doesn't mean they can't be organized. Desktop file sorters or frames keep top-tab folders straight on the desk. Using hanging files here will make it even easier if these folders will eventually find their way into a cabinet. With any of these options, labels are vital. Find hanging file folders that include tabs and inserts to keep them properly identified, while both top-tab and end-tab systems can benefit from color coded labels that make the right type of file easy to spot. For businesses of any size, shredding is a hassle. Every company has discarded information that needs to remain confidential, but the legal mandates for maintaining privacy are so strict that we grow to resent the need to render documents “unrecognizable or beyond reconstruction.” It leaves us wondering who's rooting through our trash and if our current shredding work is enough to guard against someone with enough free time and plenty of Scotch tape. There's time to spare for such paranoia, as feeding papers into a shredder is far more dull than anything involving loud, destructive machinery has any right to be. It is, however, a vital part of business and must be given proper consideration. The problem isn't that shredding is necessary. Companies open themselves up to identity theft, lawsuits and corporate espionage when the job isn't done. The problem is that failing to properly address a company's unique shredding needs is a waste of time and money. For example, one popular and easy solution is off-site shredding, where another company picks up your documents and shreds them for you. Not only can that be expensive, how secure can you really feel when something that you are responsible for destroying leaves your offices intact? If anything goes wrong, you're still on the hook for it. Shredding documents internally offers peace of mind and is more affordable, but only if the shredders you purchase are suited for your needs. An insufficient shredder means that employees will spend far too much time feeding papers, emptying bins and dealing with jams. A low-end model that can be tossed under a desk for an individual to use isn't going to cover an entire department. This buying guide helps you find the shredder that offers not only the right level of security for your business, but also the number of sheets that can be shred at a time. For a cross-cut shredder, units that can accept 10 sheets are fine for individual desks and households, 12-14 sheets are recommended for small offices, while larger offices and departments should use shredders that can handle 20-30 sheets at a time. Micro-cut shredders, which create very small particles and may be required for destroying extremely sensitive information, accept fewer sheets per pass. To really save on labor, consider Swingline's Stack and Shred model, where up to 100 sheets can be inserted into the machine, which will lock them inside and shred them while an employee can go back to work. Other innovative options that may appeal to you are the strong high capacity shredders from Martin Yale's Intimus line, the jam prevention features developed by Fellowes, and the GoEcoLife series of shredders that are both functional and environmentally friendly. We're right in the midst of winter right now, and offices in colder regions have a lot to contend with. Snowstorms can make it difficult for both employees and customers to arrive. Businesses need a proper policy on closures, working with a reduced staff and making sure slow days are accounted for and workers stay safe. Any sort of precipitation brings unwanted snow, water and dirt into the office, which can be a mess to clean up. A proper system of outdoor and indoor mats can reduce dirt and save floors. Finally, cold weather means jackets for everybody, which requires storage space that should be incorporated into the room's design rather than a seasonal eyesore. Since weather events are inevitable, policies should be set in advance to cover them. This guide outlines some of the basic questions to answer in this policy, and additional factors such as parents dealing with school closures and the prospect of working from home should be considered. However, just because a blizzard doesn't happen every day doesn't make snow, rain and cold temperatures any less routine. 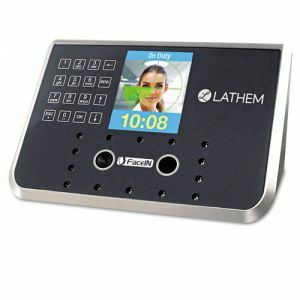 The wetter and dirtier the natural elements are, the more likely it is that they will be tracked into your office. Without proper floor mats, it's estimated that a thousand people over twenty days can track 24 pounds of dirt. It only takes 1,500 people to strip away almost half of a floor's finish in that time. The solution involves the proper use of both outdoor and indoor mats, both spanning the width of your entrance. Outdoor mats do the bulk of the work, scraping shoes to take care of the dirt. These mats are usually rubber or polypropylene surfaces with a reservoir underneath to hold dirt and water. Indoor mats use polypropylene, nylon or olefin fibers to wipe the shoes off, giving them one last clean and drying them properly before they enter the office. For a better way to give employees a place to put their coats, consider whether you use a central area, an enclosed closet, or if each person hangs coats near his or her own workstation. Central areas use coat trees or garment racks, which should be part of the room's décor. Wet climates will also want one with an umbrella holder. An alternative is a wall rack that can fit somewhere out of the way. Employees hanging coats up in their office will need a hook for their wall or cubicle, which again can be incorporated into the room. Check out our buying guide to see our full selection of racks, hooks and hangers. A new year is upon us, and companies around the country have visions of good fortunes in 2013. As we look ahead towards good times, we recognize all the hard work in store for everybody. For many, that means preparing presentations, training new employees, and filing away 2012. Three very different tasks, but what's one thing they have in common? If you said that they all commonly rely on binders, well done for reading the title of this post. Think about that for a moment- one job involves impressing clients, one involves making a lot of information easily accessible and one involves indexing records that may or may not ever be seen again. Yes, one office supply can bind them all, but why use the same binder for several jobs when different kinds of binders are better suited for each of these tasks? The most basic type of binder is the reference binder. They don't have much style (barring a few exceptions), but they are inexpensive and available in several colors. They're perfect for internal use such as company handbooks, procedures, job training, troubleshooting and any other records that are frequently viewed and updated. Storage binders are the big uglies of filing. These are designed to hold large quantities, often using gapless or slant rings, and are built to hold for years in a drawer or on a shelf. Some are designed to hang from filing cabinets, similar to hanging file folders. Data binders and post binders store computer printouts, larger sheet sizes and even more pages. Presentations and reports have a completely different set of criteria. Presentation binders are all about combining affordability in large quantities with creating a positive impression even before it's opened, which means a clear cover to allow you to insert a title sheet and/or a spine insert. Binders are also available in a smaller capacity such as 1/2” rings. The tradeoff is that presentation binders are commonly built for short-term usage, meaning they aren't suited for storage or frequent reference. 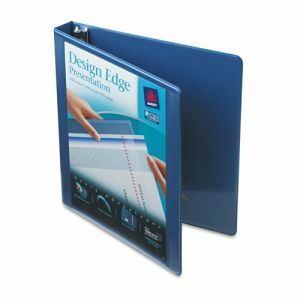 Alternatives to traditional binders include flexible binders made of clear plastic and easel binders that fold into easels to add an instant visual element to your presentations. For help finding the perfect binder for you, this binder buying guide will help sort products by size and ring type. Have you ever taken note of your posture throughout the workday? Maybe you start the day strong, fresh off your morning cup of coffee, upright and ready to produce. After several hours of that, plus a lunch break, you might spend the afternoon joining the rest of us- slouching in your chair, leaning back and doing your best to focus on your work instead of the clock. We really shouldn't blame your chair for that. There are all sorts of other factors that could be involved there. Your chair, however, doesn't usually help. However, Safco has an interesting alternative that offers a comfortable sit while still demanding concentration and posture. The Zenergy ball chair is a mesh-covered medicine ball that sits on a sturdy base and, despite its small footprint, is sized about the same as a normal chair. Without a back, it's up to you to stay upright. This isn't any more difficult than sitting on a bench, but it does require your body to sit properly. This keeps you more alert and more ready to work than when a back rest is supporting you. I've been sitting in one all afternoon, and the mesh covering does make for a comfortable sit and it certainly improves concentration. The whole good posture thing and the occasional adjustments do require a period of acclimation: I recommend sitting in the chair for only a couple hours at a time, building up to full-time use over the course of a few days. It also feels a little higher than my previous chair and a bit over-inflated. The Zenergy does include a pump for making such adjustments, which I would totally do if it wasn't a demo that I had to share with the rest of the office. The Zenergy does serve me well in particular, as I tend to be a bit fidgety at my desk, never quite content in one position. The ball allows for a bit of non-disruptive squirming, allowing me to focus on my work as the seat shifts on its own to adjust to my position. It's the same philosophy Safco takes with their Alpha-Better series of school desks that allow children to stand (or sit on optional stools) and fidget during class. It's no surprise, then, that Safco also has a smaller ball chair, the Runtz series, designed for children. It sits about 6 inches shorter but has all the same features as the Zenergy.